Woolmersdon House is a beautifully presented Georgian residence which has been extensively improved by the current owners to create a magnificent family home. The house, built circa 1780, has attractive period features throughout, with high ceilings, large sash windows, cornicing and open fireplaces. The attention to detail and the quality of the finish at Woolmersdon House are second-to-none; Sanderson and Zoffany wallpapers adorn the walls and the house has been modernised sympathetically in accordance with its Georgian heritage. The ground floor is accessed via an entrance porch with an original tiled floor and a front door with a half-moon window above. A grand reception hall, with a beautiful sweeping staircase and a slate and limestone tiled floor, provides access to the reception rooms. At one end of the ground floor is a spacious drawing room, with a semi-circular outer wall; this room is thought to have historically been used as a music room, as the semi-circular wall provides favourable acoustics. The walls are decorated with Zoffany wallpaper, two sets of French doors lead out to the gardens and a Minster fireplace provides a focal point within the room. A welcoming sitting room is adjacent to the drawing room, with Zoffany wallpaper and an open fireplace surrounded by original Victorian tiles. Also on the ground floor is a library with bespoke, handcrafted American white oak bookshelves, a cloakroom with Sanderson wallpaper and a spacious dining room which leads into a beautiful Amdega orangery with underfloor heating and lovely garden views. A large kitchen/breakfast room and an adjacent utility room complete the ground floor. The kitchen is well-equipped with an Esse solid fuel-burning stove, John Lewis of Hungerford cabinets with beech worktops, an integrated fridge-freezer, dishwasher, Butler sink, electric oven, hob, extractor fan and a Saltillo tiled floor. There are five double bedrooms on the first floor, each with lovely views of the surrounding countryside and gardens. The well-proportioned master bedroom benefits from two very large sash windows, providing plenty of natural light, and is decorated with Zoffany wallpaper. This bedroom is served by an en suite bathroom, featuring an attractive claw-foot bath and limestone tiles with terracotta detailing. Also benefitting from en suite facilities are bedrooms two and three. Bedroom four, with fitted wardrobes, is decorated with Sanderson wallpaper and bedroom five has Zoffany wallpaper. There is also a family bathroom on the first floor, which is well-appointed with a striking claw foot bath. Taunton, just 9 miles away, has an extensive range of shopping facilities and a thriving farmers’ market. There are also many excellent local producers and artisan farm shops. The Musgrove Park and Nuffield Hospitals serve the town and surrounding area. There are excellent schools for boys and girls of all ages including Taunton School, Kings College, Queen’s College and King’s Hall. Other well-known schools in the area include Millfield and Blundell’s, all within driving distance. The cathedral city of Exeter, approximately 44 miles away, offers a wide choice of cultural activities with theatres, the ramm museum, an arts centre and a wealth of good shopping and restaurants, including John Lewis and a Waitrose supermarket. There are several primary and secondary schools, both state and independent, and Exeter University is recognised as one of the leading universities in the country. Communications are excellent with the M5 motorway providing links to the A38 to Plymouth, the A30 to Cornwall, and Bristol and London to the north and east. There are regular rail services to Bristol and London from Taunton, taking as little as 1 ½ hours to London. Exeter International Airport, 40 miles away, provides an ever-increasing number if domestic and international flights, including two flights a day to London City Airport. Bristol Airport, approximately 34 miles away, provides an even greater number of international flights and connections. 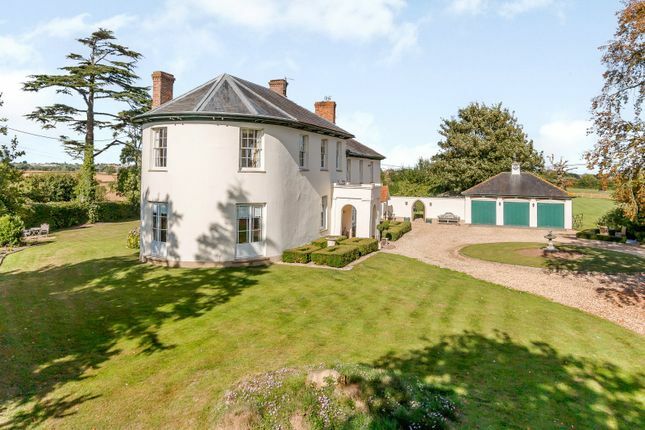 Woolmersdon House is accessed via a mobile-operated entry gate, leading to a gravelled private drive and a detached triple garage. The front gardens are beautifully landscaped, with box hedging and level areas of lawn. Lovely views of the paddock and the countryside beyond can be enjoyed from here. To the side of the house, accessed via an arched doorway in the adjoining wall between the house and the garage, is a ‘secret garden’ with a landscaped lawn and a patio surrounded by boxed hedging, providing the ideal place for al-fresco dining and entertaining. To the rear of the house is another spacious area of landscaped lawn, bordered by established flowerbeds and high hedging which provides a good level of privacy. There is a wide range of flora within the gardens, including a number of species of rose, as well as apple and pear trees. In front of the house, the paddock is well-fenced and reasonably level. 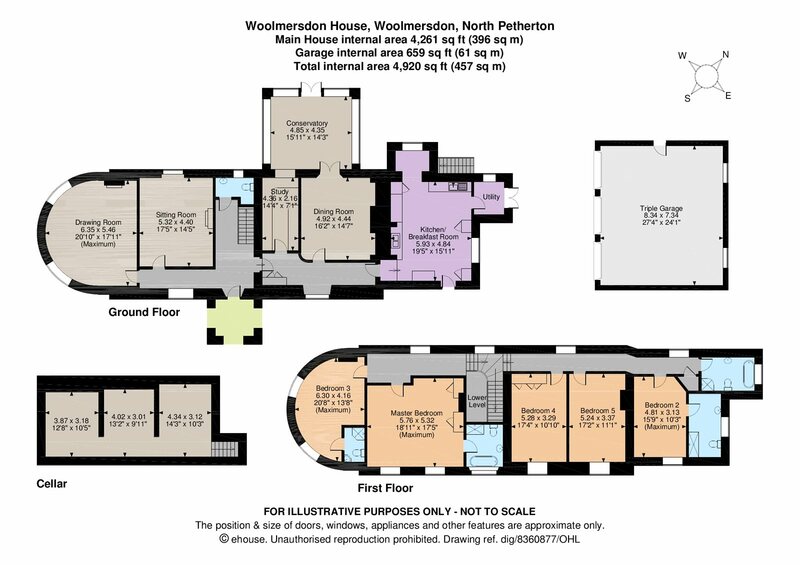 In total, the gardens and grounds at Woolmersdon House extend to approximately 7.36 acres.